The advisors have served more clients in 2017-18 than ever before and helped bring in more extra benefit than before. This for an operating deficit of £966. Been helping elsewhere, e.g. Clifton, too. But it turns out that the extra benefit raised is cos DWP have been more awkward in accepting claims. One of the daft things has been making venues for processing appeals more distant – at the end of a bus route in Strelley, and even in Leicester and Derby, instead of the previous venue in the city centre. And being able to make the more difficult locations has sometimes been suggested as reasons as to why they don’t need the benefit. The rock bottom benefits are to be frozen for another year – that’s 4 years at £73 a week. Meanwhile, the Conservative government have announced that tax allowances and the tax threshold will be raised in a ways which gives most tax reductions to the better off. There’s been some surprise that some Conservative MPs have only just realised that Universal Credit means people will lose out. Meanwhile gratitude to the 3 Nottingham Labour MPs and Vernon Coaker MP for attending a CAB 2-hour briefing 11 days previous. Concern was expressed that the disabled and children are the ones losing out most. My concern remains how the poverty is not visible enough. Health visitors and schools report the issues, but the public awareness and concern is muted. Unemployment is down, except suspicion is that it’s the ability too claim that explains the reduction. For instance, you are punished if you don’t answer phone calls, and DWP expect you to have a phone, and what’s the cost of that? Meanwhile, people need help for money to get a bus ride for a job interview, or even money for new clothing, and organisations like the One Stop Shop ate Bridgeway Centre try to help with that. I tried to explore whether Brexit and new less helpful trade deals threaten the kind of jobs low income families rely on. Having brought down the mood of the meeting by exploring all the problems we face, I dud take the time to thank the advisors of Meadows Advice Group, and the volunteers on the board who serve most, those who are in most need. 83 people attended the showing, introduced and described by Lilian Greenwood MP. £1,195,462 extra for people in need. Some of the stories of people who needed help are heartbreaking. Last year’s report is here. £1,363,858 extra for people in need. Not only strong achievements, but strong appreciation from the people served. 5 new members for the board. But sorry to lose Katie, Kate and Rachel – who helped me so much when I was Chair. 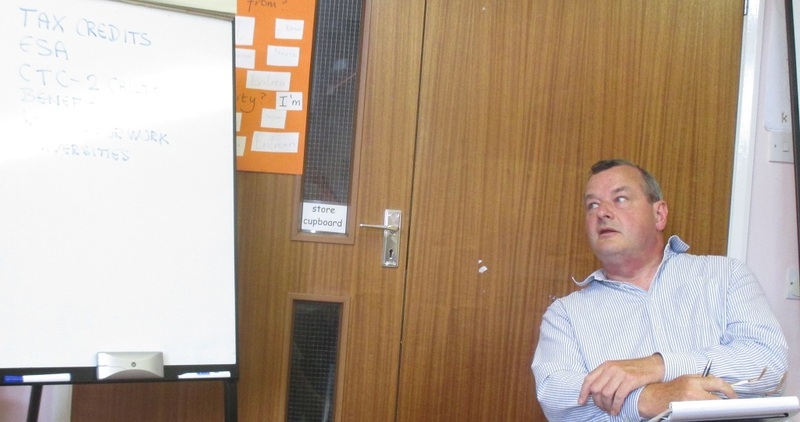 Groups from across Clifton and The Meadows met at Queens Walk Community Centre to discuss the challenges the poor and the workless face, and what more can be done to help them and help them help themselves. One of the speakers was Nottingham City Councillor Leslie Ayoola. A discussion with Lilian Greenwood MP and Cllr Nicola Heaton about changes in social security announced since the General Election, hosted by Meadows Advice Group at the Queens Walk Community Centre. This report will be updated with more numbers soon. Support Groups are planning to publish a report in October. Spending power in The Meadows could well drop by well over £1 million per annum.